Smile! Today is World Adoption Day! It is a day to celebrate the making of families bonded by love not blood. I found out about this by reading my Facebook Page. I had no idea someone set aside a day to celebrate little ol’me. You see, I am adopted. Really I am not narcissistic enough to believe this day is all about ME. There are a few others out there. The 2010 Census revealed that there were 1.5 million adopted children under the age of 18 and over 545,000 over the age of 18 living in the United States. And you may have heard of some famous people who have/had been adopted: Singer Faith Hill, athlete Daunted Culpepper, technology guru Steve Jobs, President Bill Clinton, author Truman Capote, activist Jesse Jackson, humanitarian Mother Teresa, singer Eric Clapton, and many more. But, I cannot tell their stories. I can only tell mine. I was adopted at three months of age from Catholic Community Services. My parents picked me up on St. Patrick’s Day. Today, those in the adoption circles would call that “Gotcha Day!” All I really know is that I came with a big green ribbon and the knowledge that I was three-quarters Irish by birth. This explains my love of Celtic music and Guiness beer. Before you ask…no, I’ve never met my “real” (as classmates use to say) parents. Yes, I had a normal upbringing—a gift from my mom and dad. My adoption story–really my life story–is a happy one. I have always known I was adopted, which was important because I never had an issue with it. Others may have, but I did not. Besides, I would have figured it out in early adolescence when I stood beside my statuesque, flamingo-like cousins. I was the lone duckling among a pat of flamingos. But, I wasn’t alone. Other adopted children were a part of my every day life: my brothers, a cousin, my next-door neighbor, and family friends. Plus, my father, the legal eagle, handled a large number of adoptions in the South Florida area. Adoption was a common topic at the dinner table. Eventually, I married a man who had two adopted siblings. Surrounded as such, I knew I was not some strange anomaly in the universe. Most of my life I never wanted to find out about my birth heritage. Partly because I was happy with my life as such and partly because I felt it would be a betrayal to my own parents to seek out information on my birth parents. Besides I was busy getting through school and starting a career. I had neither the time nor the inclination to conduct any searches. As I teacher, we all know I didn’t have a lot of extra money for any private investigators. Do I have an identical twin out there somewhere? In my early 30s, I did have a passing fascination with identical twins and thought I might be a separated twin. I loved reading stories about how identical twins separated in early childhood finally met and felt complete. I found it eerie that they had uncanny similarities like one set of twins were both firefighters married to a woman named Linda. They were both overweight, wore their hair the same way and owned the same breed of dog. Really, how cool is that? I often wondered what it would feel like to stare into the face of someone who looked and sounded exactly I did. It wasn’t until I had my second child that I ever saw anyone who looked like me. When I raised the idea of being a separated twin, my mother doubted the validity of my new instinct. She was confident that the adoption agency would have told them that information. So, I let that fixation go. Every once in a while, my heart becomes sensitive to this notion of adoption. For example, my cousin adopted a little girl from overseas, and she chronicled the beautiful experience in a blog. I was quite emotional thinking how lucky this child was to be placed with my beautiful, smart, funny, loving cousin. When another friend found out she and her husband were to adopt a little girl with only 24 hours notice, the hair on my arms stood up with excitement for them. Another good friend of mine adopted a girl from China about 4 years ago. Watching her deep love for little girl not born from her womb mades me better understand the fierce love my own parents had for me. I always felt loved as a child. Yet, witnessing this love as an adult was powerful. There was one time I gave a great deal of thought about my birth parents. It was right after I saw the movie Juno (2007). This was a quirky and honest film about a teenage girl’s experience with an unplanned pregnancy and her journey to find the right adoptive parents for her child. The movie ended happily for the mother, child, and adoptive mother. Nonetheless, at the end of the movie my husband found a sobbing ball of goo almost unrecognizable as his wife. He was a bit confused as the movie was a comedy. We had to sit in the theater long after the credits rolled before I could get my act together. Something in that movie opened a floodgate of raw emotion inside me. My mother had passed away two years earlier so she was on my mind nearly every day. I knew her journey, but it was then I started thinking about my birth mother’s journey. I suddenly wanted to know her story. Of course, life got in the way. I had three children ages 3 and under, and I had no time to think about anything other than coupons for diapers and chocking hazards. I never really it gave much energy and attention to seeking out my birth family. Quite frankly, it saved me a lot of time when I had to fill out my medical history for a doctor. I usually just write UNKNOWN-ADOPTED. However, that changed when Annie, my eldest daughter, entered 5th grade. Annie has many learning difficulties—most of which I have discussed previously. She has dyslexia, ADHD, slow processing system, and a sleeping disorder. Up until 5th grade, Annie never thought much about her own issues. She simply plugged along trying to compensate the best she could. And, she was doing a fantastic job learning how to learn in her own way. Then she hit an emotional wall. Annie turned around one day and realized that she was different, and different was not good, according to this prepubescent Annie. She continually asked why questions. “Why was I born with dyslexia? Why do I have ADHD? Why does it take me longer to finish my homework than most people?” My answer was always the same: God made you that way. You are special. There are many people with your issues who do great things. Like the children in a Peanuts cartoon, I think she only heard, “Blah, blah, blah.” Annie was a smart girl. She knew about genetics, and she was looking for someone to blame for her unlucky inheritance. Since I am adopted, I was her bull’s eye. “It had to come from your side of the family, Mom.” Maybe so. I don’t know. “Why don’t you find your birth parents and ask them?” Ha! Yeah, I’ll get right on that I said. I looked into her large grey-blue eyes, and realized she was serious. Annie wanted me to do some digging. So, I got out my proverbial shovel and started digging for answers. I did not necessarily want to meet members of my birth family, but I would try to find out some medical and other history if I could. I signed up with Adopted.com and the Adoption Registry, provided what particulars I knew about my birth, and waited for someone to make a connection. Meanwhile, I discovered that the adoption laws in this country differed from state to state. Florida, the state in which I was adopted, is a closed adoption state. That means all my original birth records are sealed and it would take an act of God to open them. Okay, not an act of God per se, but I cannot look at my original birth certificate without a court order. It has been over a year since I started my search. I have learned a few things along the way, but I am currently at a standstill. I was paying a monthly fee to Adopted.com, and no results manifested. So, I deactivated my membership there. Writing this post about my adoption experience has motivated me to continue my search with a little more enthusiasm. So, it’s back to the Internet drawing board. 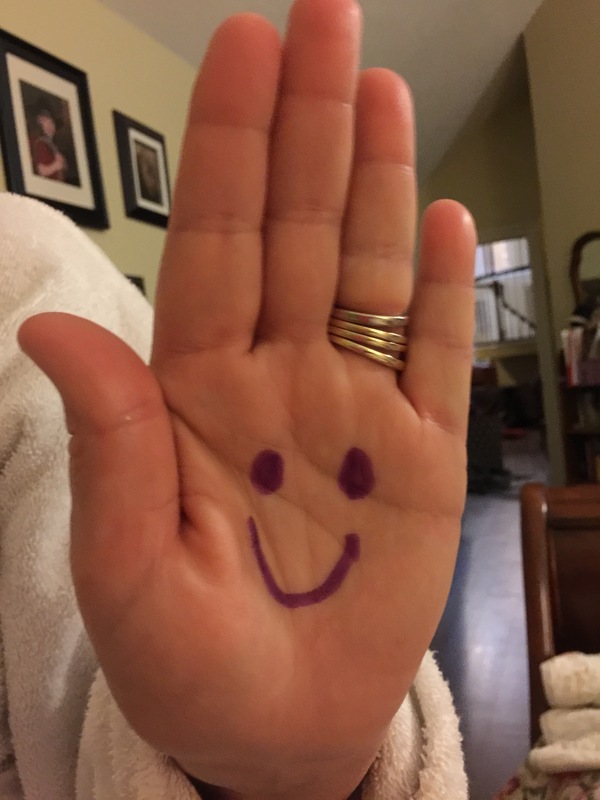 In the meantime, I will keep smiling, just like the World Adoption Day logo of a simple smiley face on a hand inspires us to do. Cara, I LOVE a great adoption story since I’m adopted too!!! I suppose you contacted the Catholic Community Service place to no avail? I contacted the adoption agency I was adopted from and was told I needed to attend counseling in order for them to search for my biological parents which I only wanted medical information from. That didn’t happen. Good luck in your search!